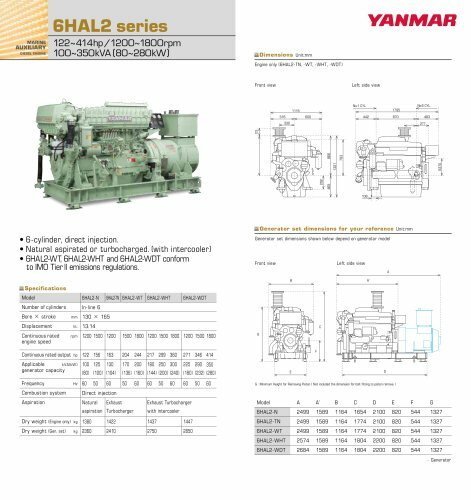 MARINE AUXILIARY DIESEL ENGINE 122~414hp/1200~1800rpm 100~350kVA (80~280kW) — Dimensions Unit:mm Engine only (6HAL2-TN, -WT, -WHT, -WDT) Front view Left side view • 6-cylinder, direct injection. • Natural aspirated or turbocharged. (with intercooler) • 6HAL2WT 6HAL2-WHT and 6HAL2-WDT conform to IMO Tierll emissions regulations.